But writing a post on my blog doesn’t always happen even if I want to. You know the reason. We all are busy with our lives. Although writing a post takes less than usual time for me, I still often feel too lazy to write post. When a bunch of thoughts or events are in store to write about, I start writing a really long post talking about each of them. This is how Days As They Go By series started. What do you do when talking over phone? I usually have trouble when talking to phone for no obvious reason. It’s like I can’t find what to say next. But in rare instances, when the person I’m talking to speaks endlessly, I feel good. And that’s when I start thinking of what to do besides holding my phone next to my ear. This may sound stupid, but I really get tired if all I’m doing is just holding my phone. From my childhood, I have a habit of drawing random things using a pen. Well, don’t get me wrong; it’s no art. I just keep writing random words, keep illustrating random logos and such. 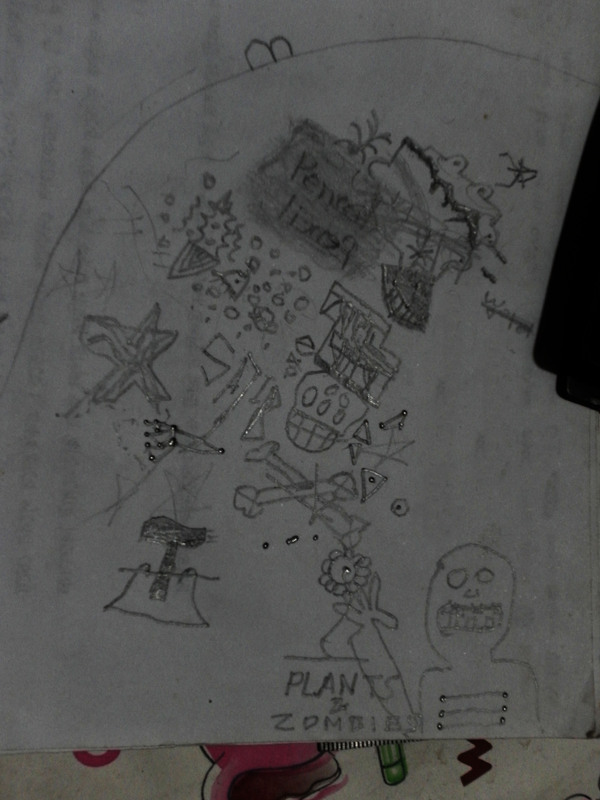 You can say that these random doodling illustrates what my subconscious mind has. I’m talking over phone so my mind is working on that. And my subconscious mind is working on other thing that I can’t really tell, ever. But these doodling seems to be working fine to reveal what’s going on my subconscious mind. Now, take a look at this subconscious canvas. Can you relate to anything? I can only relate to two things. My name, and Plants vs Zombies. Find anything you know? Tell me about it. Ugh! Exams! Something I can boldly say that no student in the world admires very much. But the things we hate always haunt us. Exam is no different. Regardless of how much you hate it, you will have to attend it whenever it comes around. I had a week full of exams. Two exams a day. I heard that these exams were kind of valueless. The marks obtained will not be added to the pretest exams. We figured that our teachers want to avoid taking classes and the best way to do that, after as long as 2 and a half months of vacation, is to hold exams. I were devastated. But I saw many students not attending exams as there was this saying that those exams were not important at all. I had to attend all of them, though. Not to mention I had a devastating exam as well. But given that the marks are not to be added to anything, I have reasons not to be tensed. There could have been more to add to what happened in the past weeks. But due to that horde of exams, my days literally died. 😦 Now that exams are over, I thought I’d be happy again. But luck is bad. Pretest exam is to be held soon; possibly by the middle of next month. My preparation is close to nothing. All I can do is pray that the exam date is pushed back. Yeah there is a big star that actually looks awkward. I can do better. 😛 You can see that by the surrounding stars. The corners aren’t pixel-perfect as I wasn’t concentrating on this. Aw, thank you! 🙂 I don’t know if that sweet part is actually true 😛 but yeah I think we did good yesterday mostly because it was calm in both my side and your side. If either of us were in a noisy place, the conversation would have become more difficult. In my case, it’s different. I doodle in my notebook while listening to my professors talking..